Description: Two NS widecabs bring an eastbound freight into Allentown at Auburn St as the UGI tower in the background is being dismantled. Description: While on my wayhome, I spotted this lashup at NS's Enola Yard. Title: WB 19G @ 1038hrs. Description: Westbound roadrailer train passes through Horseshoe Curve with a SD70M leading a 8-40CW still in standard Conrail paint. Description: NS 503 rolls west through Altoona. Description: The first of NS' newer SD70Ms, which also happens to be the namesake of my friend and fellow RRPA contributor Jay Tester, sits near the yard office in Jackson yard. Description: NS 2591 sits at Jackson Yard. 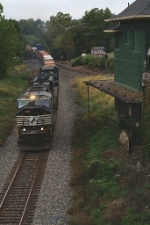 Description: An empty coal train heads west with NS SD70M and NS D9-40CW 9853. Description: A side view of NS SD70M 2591.